Adele Armstrong (Christina Mundy) and John Morris (Gerry Evans) were excellent in Clonmel Theatre Guild's production of Dancing at Lughnasa. 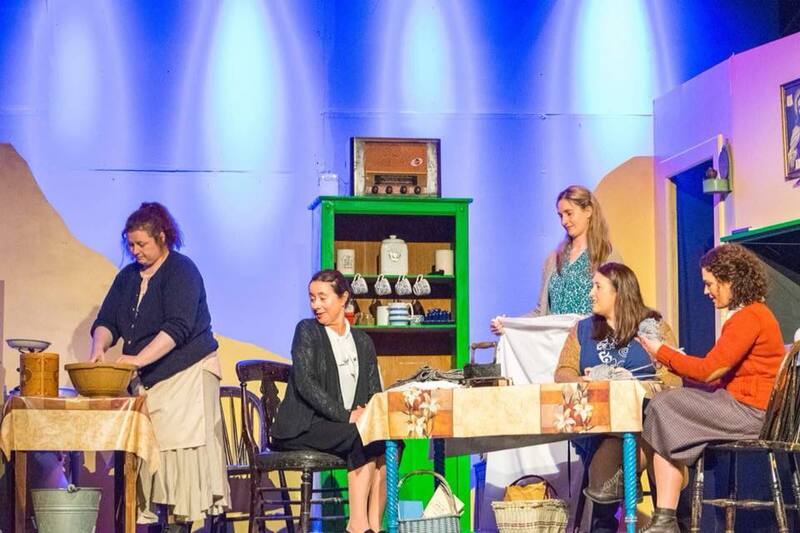 “I can't say enough about the cast and crew who put 100% into the production,” praised director Paul Kelly following Clonmel Theatre Guild’s engaging performance of Brian Friel’s Dancing at Lughnasa at the White Memorial Theatre. The Guild cast - which included debutantes Sean Scott (Michael Mundy), Jennifer Lynch (Maggie Mundy) and Suzanne Kirwan (Agnes Mundy); Fidelma Collins (Kate Mundy); Carolanne Mullooly (Rose Mundy); Adele Armstrong (Christina Mundy); Edmond Ryan (Fr Jack); and John Morris (Gerry Evans) - thoroughly embraced and propelled the constraints experienced by the Mundy family in the fictional Donegal town of Ballybeg in 1936, while unearthing the sisters passion for song and dance and desire to find love. Paul admitted that uncovering Dancing at Lughnasa’s complex layers, which include the influence of religion and the inevitable realism of the tribulations ahead, involved “a lot of hard work and commitment” from the cast. “The cast weren’t used to being in such demanding roles and they had to work very hard on characterization. I got a nice quote from someone on the opening night who said ‘it was a very good solid production with characters that were very grounded’. And by the time we got to Saturday night the cast were galloping out of the stalls and knocked it out of the ball park,” Paul told The Nationalist. From the mundane setting of the family cottage staged at the White Memorial Theatre to the buoyant music of Marconi, Friel’s masterpiece was crafted together with detail by the Guild and effortlessly drew plaudits from audiences throughout. “Getting the right lighting was important so that we could convey the themes and the tones of the play. Paul Kavanagh was super - he gave a full day getting the lighting up and brought his own suggestions to the table,” Paul continued. The timing of the play, albeit a coincidence, couldn’t have been better for the Guild, with empowering women and equality at the forefront of the news agenda across Ireland and afar. “Dancing at Lughnasa is a very popular play. The society that it’s set in, albeit a fictitious place, is still very much relevant. Friel has an awful lot to say, even when you look at society today and a lot of the issues that come up in Lughnasa are still relevant. The main thing is that we deal with his work thoroughly. It’s not to be taken lightly and we must reflect on the themes and tones of Dancing at Lughnasa,” Paul added. Fidelma Collins was exceptional in the role of Kate, a character with a very different personality to her own. “Kate comes across as severe and strict, whereas I would be quite bubbly and fun-loving and it was a challenge was for me to be so serious. In some ways Kate is a misunderstood character and it’s the circumstances that are forcing her to be so serious and she has the weight of the world on her shoulders. She is trying to hold the house together and she loses her job because the church disapproves of Fr Jack’s activities in Ryanga,” Fidelma said. “I enjoyed the challenge of playing Kate on the White Memorial stage and I felt it improved me as an actress, broadening my horizons as opposed to just doing comedy all the time. I learnt an awful lot from the production and the director Paul Kelly in particular because he persisted with me, watched my every movement and brought me on a lot,” Fidelma added. Dancing at Lughnasa producer and Guild chairperson, Carol Acheson, commended the “powerful” production. “Dancing at Lughnasa is all about the interactions between the characters, even if they are not saying anything. The sisters have this secret relationship going on between them, with glances and subtle nudges. Paul Kelly worked with the cast on making that sort of relationship without any words more intense and ensured that it was conveyed properly on stage,” Carol praised. Carol said it’s “fantastic” being part of the Guild, which celebrates its 50th anniversary in 2019. “Seeing the Guild go from strength to strength has been great. We never leave a drop in audience numbers dishearten us and we keep coming back stronger,” she added. The Clonmel Theatre Guild's production of Dancing at Lunasa was excellent. Congratulations to Paul Kelly and his cast.